After yesterday's post I was thinking some more about recruitment fairs. I'm probably not the best person to write much about them as I've only ever attended one and have got all my other jobs by just applying directly to schools (or even having the school come to me). However many of my friends have gone the job fair route and I was interested to see if this experience gave them a true idea of what it is like to be at a school or to live in a country. Most teachers attend recruitment fairs in the winter or early spring. This means that teachers often have to wait another six months before they move to their new country/school and it's usual for the first contract to be a two year contract. At the job fairs you are basically signing up to a place where your first opportunity to leave may be two and a half years away. If you make a mistake at the job fair - that has far reaching consequences! Of course it's possible to resign - in some cases there are financial penalties for this and it may also be hard to get another job if you break your contract. Despite this I know of several close friends (and several administrators) who have actually found that the new school they moved to, for various reasons, was one they just could not stay at, they broke contract and I have to say every single one of them moved onto something better. Perhaps the threat of bad references are just that - a threat. Perhaps the new schools they are going to don't place much credibility on a bad reference from a dodgy school - hopefully these schools place more emphasis on the references that teacher has from 10 or 20 years in good schools, rather than the one bad reference based on one bad year in a not very good school. Resignation is usually a last option, however. Moving on is expensive, despite attractive relocation packages, and the disruption to families is often too much to contemplate. Many teachers who find themselves in a bad situation simply wait it out to the end of their contract and leave at the first possible opportunity. This is one interesting theme that has emerged from the teachers who have spoken to me: the person doing the hiring is often someone who is very removed from the new teacher once he or she actually arrives in the new school. Often headmasters and directors, who may indeed make great presentations at recruitment fairs and who may be full of charisma there, are not part of a new teacher's day to day experiences once he or she is actually working at a school. In the case of schools spread out over a number of different campuses the new teacher may not even see the person who has actually done the hiring for weeks or even months at a time. I have even been hired by administrators who themselves have left the school by the time I arrived there. Going back to the bus analogy, the administrator who hires you may not be the person driving the bus at all, or at least maybe not the bus you are on. That person may be more like the manager of the bus company. You arrive at the bus station and get onto a bus, driven by a completely different person. Perhaps that person drives too fast, or too slow. Perhaps that person weaves around all over the road. Perhaps you even have the impression that the driver doesn't have much experience of sitting in that seat, that before they have driven a different type of bus or perhaps the experience that driver has is from a country where they drive on the left, but you are now in a place where they drive on the right. Perhaps you are wondering if the person driving the bus knows what to do if the bus breaks down. Sometimes the view out of the bus isn't a great one either. You may be heading in the right direction with the right bus driver, but perhaps you are travelling along a road full of potholes. Perhaps the journey itself isn't that exciting, perhaps it is even dangerous. 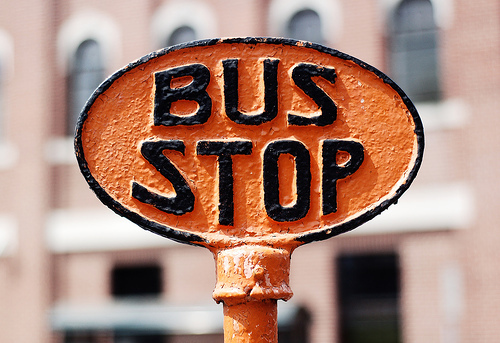 Do you stay on the bus and wait for it to get to the last stop, or do you get off and try a different route? Is the destination worth it, or do you want a more pleasant journey? Of course there are some people who will never get off the bus. It's safer and more comfortable on the bus than it is outside and who knows how long it will take for another bus to come along (oftentimes these are not really the people you want to keep on the bus!). Others will jump off at the first bus stop - in the case of teachers at the end of their first two year contract. Most of us don't do that, however. We sit put for a bit and look for a good place to get off - one that has connections to many other routes, ones where the buses that are there look a bit more comfortable, or perhaps where the drivers look at bit more reliable. What I've seen happening more and more with friends recently is that they are on a bus and using their mobile phones to talk to people on other buses. What's it like on your bus, they ask, is the driver any good? How much do the tickets cost? Is your bus likely to be coming my way anytime soon? So Jim Collins' analogy of good to great can be thought of from two different perspectives. It's not just a matter of getting the right people onto the bus - it's a matter of KEEPING those people on the bus - and sometimes that can be more challenging than getting them on in the first place. While heads of schools are busy trying to get the right people into the right seats, the teachers themselves are asking who's driving this bus? Wow. What a timely post for me. Thanks for sharing this. You elude to this in your post but it is both the driver and the bus. My school is being turned into a charter next year but the 6-8 part of the K-8 is staying public and being phased out over three years. The bus is headed in the wrong direction. I don't know who the driver is going to be. It's a scary time. I have to figure out if I stay on this bus, going in the wrong direction currently without a leader, or do I stay on the bus because I truly love the students that I'm working with and I desire for them to have at least one quality teacher. Both sides of the argument are convincing for me. I typed one side and thought, "Wow, that sounds like a no brainer." Then I typed the other side and thought, "Wow, that sounds like a no brainer too." Then I think about my family. How is this bus going to affect my family? Then I thought about my career? How does this bus affect my career? Thankfully, I'm ready ready to give up on buses all together and try trains or planes. Hi Knaus, it's hard to be part of an organization that is heading in the wrong direction. I know people who have been in schools like this and have referred to it as "professional suicide" - they wondered would they ever be able to leave and find something better because being part of those places sapped their self-confidence and self-esteem. It sounds like you are in a hard place right now and I wish you luck with your decision making.